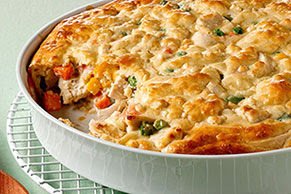 When a chicken pot pie bubbles and oozes this much creamy comfort in every bite, you know you’re home. Cook cream cheese and broth in large saucepan on low heat until cream cheese is completely melted and mixture is well blended, stirring frequently with whisk. Stir in chicken, vegetables and garlic powder. Spoon into 9-inch pie plate. Whisk egg and milk in medium bowl until blended. Add baking mix; stir just until moistened. Spread over chicken mixture. Place pie plate on baking sheet.